The appearance of the lane of cherry trees in such a strange place baffled me but the answer came from StilinBerlin on Twitter and combines with the second interesting fact about the park - it actually runs along where the Berlin Wall ran 25 years ago. 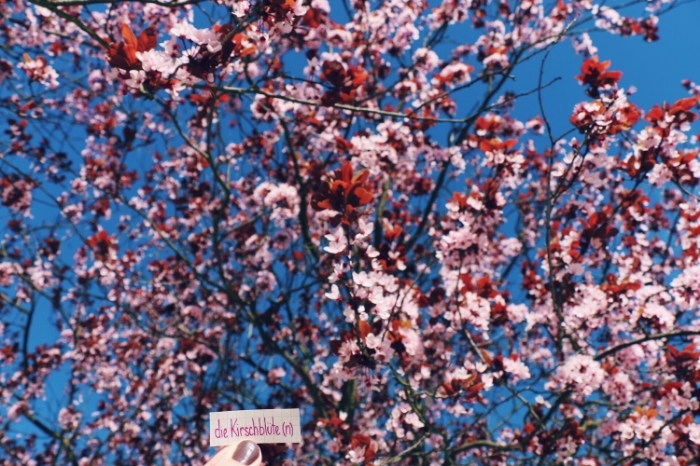 Back in 1990 a Japanese TV station asked it's audience to raise money so that they could bring peace and harmony to the newly reunited Germany in the form of cherry trees. They raised about €1 million and came to Berlin to plant 9,000 trees over the next 20 years. The cherry blossom season is almost over now but if you want to find the special paths then there's more details over on Slow Travel Berlin's blog. The best part? There's now a street in Germany called TV-Asahi-Kirschblütenallee. True story.